Integrating motorized window coverings is an easy and smart way to add value to your home. With the touch of a button, you can easily operate your window treatments or use your smart-home systems like Google Assistant, Amazon Alexa and more. And without the need for cords, your home is safer for kids and pets. Hunter Douglas PowerView® Motorization allows you to program your blinds and shades to open and close throughout the day – even when you are away from home. With the intuitive PowerView App, you can use your tablet or smartphone to program and control your blinds and shades to move to any position. In addition to the PowerView App, you can also operate PowerView settings with the PowerView Pebble® Control – a modern take on the traditional remote. Designed ergonomically, the Pebble offers seven smart colors and will enhance any décor. Along with controlling your window coverings through the PowerView App, PowerView also seamlessly integrates with other sophisticated whole-home automation systems. Complete integration with your existing automation systems, including lighting, security cameras, outdoor screens, AV systems, and more. Compatibility with Nest®, Logitech® Harmony Home, Control4®, Universal Remote Control (URC®), ELAN Home, Savant®, Remote Technologies Incorporated (RTI) systems, and more. Integrate into DIY systems such as Alexa, Apple Home, and Google Home. Make your window treatments work for you by keeping your home energy-efficient by opening and closing when you want, even if you aren’t there! At Exceptional Views, we are pleased to bring our window coverings, motorization and fabrics to your home so we can provide you with the best shopping experience. We service Baltimore including Towson, Lutherville, Timonium, Cockeysville, Reistertown, Ellicott City, Columbia, Clarksville, Fulton, BelAir, and surroundings areas. 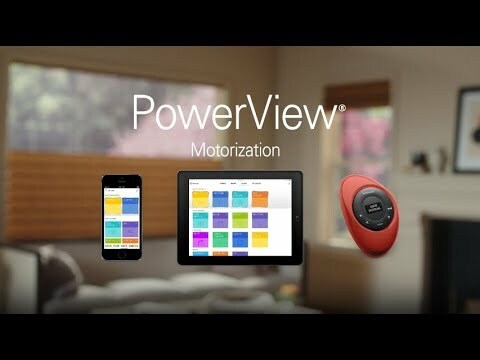 View Hunter Douglas PowerView Motorization in action for yourself.